In a sensational incident, an incident of alleged molestation of a minor girl took ugly turn when infuriated public damaged the Garuajhar office of ruling Bodoland People’s Front (BPF) on Sunday night. The BPF office is located under Panery Police Station in Udalguri. Reportedly, one 33-year-old Suraj Kurmi, a resident of Bhutiachang Tea Estate, allegedly molested a nine-year-old girl at Garuajhar Chowk on Sunday evening. The girl, who was accompanied by her mother, created hue and cry following which the accused allegedly introduced himself as the brother-in-law of Nonaiserfang BTC MCLA, Suresh Tanti and fled from the scene. 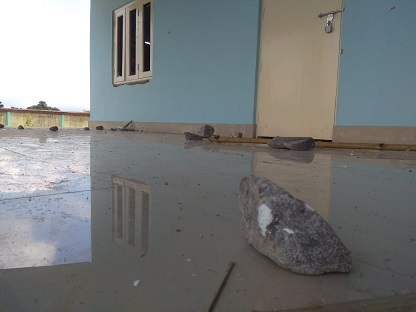 Following the incident, infuriated locals vandalized the BPF office and damaged the window panes and ceiling of the office. 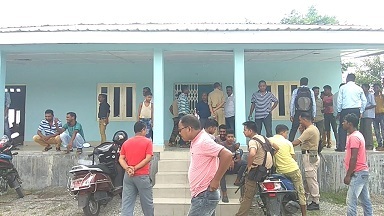 The incident prompted the Additional Superintendent of Police, Udalguri Abhijit Gurav and Deputy Superintendent of Police, Udalguri, Moidul Islam to rush to the spot to control the law and order situation. Meanwhile, MCLA Suresh Tanti told media persons that the youth is not known to him and he should be punished as per the law. He also termed the incident as a political conspiracy to malign his image. The Panery Police based on an FIR lodged by the parents of the victim girl arrested the accused, Suraj Kurmi. As case (No 71/18) has been registered against the accused under section 8 of the POCSO Act. Police also apprehended Taizuddin Ali (27 years) and Noor Islam (32 years) on charges of vandalizing the BPF office on the basis of an FIR lodged by Nonai Serfang Block BPF. All the three accused youths were produced in Udalguri district court which forwarded them to the judicial custody on Monday.